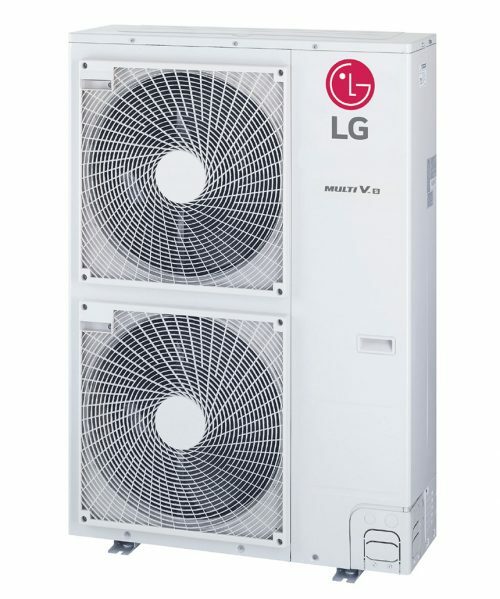 LG’s Multi V™ S is a compact and lightweight 5-ton heat recovery unit that only requires single-phase power, making it the first of its kind in the U.S. market. In the smallest footprint available for a heat recovery system, the Multi V S provides simultaneous heating and cooling for up to twelve indoor units, ensuring user comfort and providing a viable heat recovery solution for residential and light commercial applications. Featuring LG’s high-efficiency inverter scroll compressor, the Multi V S boasts a wider operating range with cooling capabilities in ambient temperatures up to 122°F as well as heating operation down to -13°F making it a great solution for year-round comfort. Prior to the Multi V S 5-ton heat recovery, homeowners and business-owners that wanted single-phase heat recovery only had one option: a large, 6-ton unit. Now with the Multi V S, customers have a smaller capacity and size option that only requires single-phase power and can provide personalized comfort through simultaneous heating and cooling. With the industry’s focus on performance in a smaller package, the Multi V™ S is at the forefront and fulfills a large, long-awaited market need in applications where space, smaller capacity needs or single-phase power requirements are limiting factors. Prior to the launch of the Multi V S 5-ton heat recovery, the only single-phase VRF heat recovery system was in a 6-ton capacity, weighed 600lbs and was over 72” tall x 30.7” wide, making it bulky and impractical for many applications. With a smaller capacity (5-tons) and a compact design (only 256lbs and 54.3” tall x 37.4” wide), the Multi V S 5-ton heat recovery is a perfect solution for owners looking to increase their energy efficiency without sacrificing comfort and allows builders and contractors more precious space for tenant use. The Multi V S is compatible with LG’s Multi V full line of indoor units including Art Cool Mirror, Art Cool Gallery, wall-mounted units, and vertical/horizontal air handlers giving customers the flexibility to design a solution that’s perfectly suited for their aesthetics and space. The Multi V™ S is a 5-ton single-phase heat recovery Variable Refrigerant Flow (VRF) system that can support simultaneous heating and cooling for up to twelve zones. With a smaller capacity, compact design, and single-phase power, the Multi V S 5-ton heat recovery is the ideal solution for homeowners looking to increase their energy efficiency and lower their energy costs without sacrificing comfort. As a heat recovery system, the Multi V S delivers simultaneous heating and cooling within the same system. Within a home, this means one room with a southern exposure could be in cooling while the another is in heating through the use of only one system. Simultaneous heating and cooling isn’t simply a comfort benefit, it also enables superior energy efficiency because it redistributes rejected heat to areas that need it; effectively managing the energy demands across the entirety of the system while eliminating the need for a secondary system. The Multi V S is compatible with ducted and duct-free indoor units including LG’s award-winning Art Cool Mirror, Art Cool Gallery, standard wall-mounted and several other handling models giving users the flexibility to get the system that’s best suited for their space.